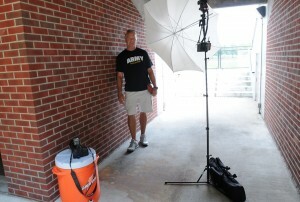 Yesterday I had the opportunity to meet and photograph a former Olympian at West Point. 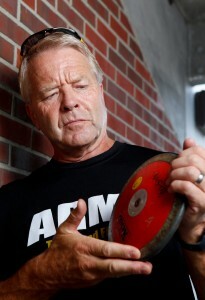 Knut Hjeltnes (left) was a discus thrower for Norway and competed at three Summer Olympic Games: Montreal in ’76, Moscow in ’80 (boycotted), Los Angeles in ’84 and Seoul in ’88. He’s been an assistant track coach the last 12 years at the United States Military Academy at West Point. Since temperatures were pushing up into the mid-90’s again, I quickly decided to photograph him in the tunnel below the grandstand of their small stadium used for outdoor track competitions. (thank goodness I’d seen the assignment the night before and knew instinctively to prepare my small strobe kit for portraits.) It would’ve been just too hot to make a nice portrait of him out on the track or turf field in the noontime, blazing sun. And besides the oppressive heat and humidity, I knew I’d have a subject with squinting eyes and possibly ugly shadows under his eyes as well. I realistically wanted to avoid a nightmare portrait shoot. Coach Hjeltnes was totally agreeable to patiently wait the few minutes it took me to assemble my quick & dirty one-light portrait strobe setup and we went to work. I even utilized the empty Gatorade cooler at lower left as a step stool to make a few frames. The practice discus he’s holding was basically the only prop I had to work with, as I ditched the idea in my mind to have him sit on the cooler, holding the discus. The whole shoot, from setup to breakdown took all of 20 minutes… ~cg. This entry was posted on Saturday, August 4th, 2012 at 12:48 PM. It is filed under Assignments:. You can follow any responses to this entry through the RSS 2.0 feed.